One year since Crimea was annexed by Russia, polling reveals that (with the notable exception of the Tatars) the new order enjoys legitimacy among the population. Russia’s annexation of Crimea was an illegal act under international law. It is also an act that enjoys the widespread support of the peninsula’s inhabitants, with the important exception of its Crimean Tatar population. It is now a year since the Russian seizure of the peninsula and installation of a pro-Russia local government. The hasty organisation of a referendum (illegal under Ukrainian law) held on 16 March, produced a 96.77% vote in favour of joining Russia. Russia subsequently formally annexed the peninsula on 18 March 2014. To grasp the conundrum that Crimea presents to the international community, we need to appreciate the disjuncture between scale and legitimacy it represents. For 100 states in the UN General Assembly, Russia’s annexation was a violation of Ukraine’s territorial integrity. The move was contrary to the Budapest Memorandum, which Russia was a party to. For Kyiv, it was an illegal vote by an undemocratic regime installed by an occupying force. ‘Reunification’ with Russia enjoys considerable legitimacy within Crimea among most of the peninsula’s population. Nevertheless, on the ground in Crimea, prevailing opinion at the inter-state and state level does not matter. ‘Reunification’ with Russia enjoys considerable legitimacy within Crimea among most of the peninsula’s population. It is also considered legitimate within Russia itself, where, in 2014, polls revealed rising levels of support for the annexation from 64% in March to 73% in September. Our highlighting of the conundrum is based on the results of a public opinion survey we organised on the Crimean peninsula in December 2014. The survey was a random scientific survey of 750 respondents administered by the Levada Center, a Moscow-based polling firm with a reputation for integrity, professionalism and independence. We have worked with the Levada Center for over a decade on public opinion polling, within the Russian Federation in 2002, in the North Caucasus in 2005, and in the breakaway Georgian region of Abkhazia in 2010. In April 2014, the Political Science division of the US National Science Foundation awarded us a RAPID research grant to examine public opinion in response to the EuroMaidan protests, the toppling of President Yanukovych, and the subsequent annexation of Crimea. Initially, we did not propose to sample in Crimea because we did not consider a reliable survey possible. Instead, we began discussions on a survey in southeast Ukraine with the International Institute of Sociology (KIIS) and the Levada Center on Abkhazia and other ‘de facto states’. In these discussions, we learned of the long record of cooperation between KIIS and Levada, one that stretched back to Soviet-era personal networks within the discipline of sociology. This cooperation became significant when Russia annexed Crimea; it meant that KIIS’s interviewers could no longer work for a Kyiv-based firm. They could, however, work for the Levada Center. We thus decided to conduct an equivalent survey in both southeast Ukraine (the regions of Odessa, Mykolaiv, Kherson, Dnipropetrovsk, Zaporizhia, Kharkiv, but not the war zones of Luhansk and Donetsk) and Crimea. This survey comprised approximately 150 questions that covered standard demographic questions and a series on identity, politics, geopolitical events, media viewing habits and problem perceptions. The survey took on average about 45 minutes to complete and was conducted in Russian between 12 and 25 December 2014. The field report indicated no interference by Crimean authorities with the survey. But since the last Ukrainian census was 14 years ago, and we have no reliable estimates of how many have left Crimea since March, there are innate difficulties with survey research there, before we even consider the political climate. Of the sample, 63% declared their nationality as Russian, 21% as Ukrainian and 8.5% as Tatar. This last figure almost certainly under-samples this important but difficult-to-survey group, which was 12% of the population in the 2001 Ukrainian census; and possibly larger today. 28% of respondents are pensioners, an important demographic in a peninsula with many veterans and other retirees. 17% work in services and most of the rest in a broad range of professions. We discuss here four key features of the survey, the full results of which we hope to publish later. Is Crimea moving in the right direction? First, the great majority of the sample (85%) declared that Crimea was ‘moving in the right direction.’ This finding is in contrast to previous polling conducted in Crimea. Polling by the International Republican Institute found only 6% of Crimeans believed the country (Ukraine) was heading in the right direction in November 2009, 11% in October 2011, and 24% in May 2013. The May 2013 figure for how Crimea specifically was heading was 22%. We have found that this generic question about the direction of a region is a powerful predictor of political preferences, and it also encapsulates a variety of beliefs about recent economic performance and future expectations of prosperity. A remarkable difference is seen in the response of the Crimean Tatars to this key question, with only 28% agreeing that life was improving. The disaffection of Tatars since the annexation is well documented and their political and human rights situation is increasingly precarious. Likewise, Crimeans have different perceptions about Russia moving in the right direction, with over 90% of ethnic Russians and Ukrainians believing it to be so, but only 33% of Tatars feeling that way. These results were recorded at a time when the rouble was dropping precipitously in value against Western currencies, and economic sanctions against the Putin administration were being ramped up. Compared to the opinions of Russians (reported by Levada in the most recent omnibus at 56%,) residents of Crimea are much more optimistic and demonstrate the highest positive scores on this ‘right-wrong direction’ question that we have seen in multiple surveys across territories of the former Soviet Union. The responses to the right-wrong direction question are strongly correlated with the respondent’s own personal outlook. Only 12% of Ukrainians and Russians say that their mood could be described as either ‘stressed’, ‘angry’ or ‘anxious’, with Tatars indicating a rate that is double that of other Crimeans. These ratios, again, are very low compared to others in zones of political tension of the former Soviet Union. The responses are not motivated by material wealth, which is low and quite similar to other post-Soviet regions. In a complementary manner, over three-quarters of the non-Tatars expect to be better off in two years compared to half of the Tatars. The dramatic switch of the peninsula from Ukraine to Russia has even increased levels of optimism about future personal wealth. Was annexation a good idea? Consistent with and motivating positivity about Crimea’s direction, the annexation of the peninsula by Russia has the support of a strong majority of the Russian and Ukrainian ethnic groups. When asked if the annexation was a ‘wrong decision,’ ‘generally a right decision’ or ‘absolutely the right decision’, 84% of this combined group picked the third option. The Tatar response on this question is almost split evenly, with about one-third picking each of the first options and only 20% the 'absolutely correct' option. These responses indicate that had a legal referendum that met international standards been permitted in Crimea (as Scotland held in September 2014), there would likely have been a majority in favour of leaving Ukraine and joining Russia. As it was, the referendum was characterised by all manner of illegal practices and conducted in a coercive environment. The Tatars' decision to boycott, further underscored legitimacy questions. Russians in Crimea have a very negative opinion of the EuroMaidan movement. Pre-annexation surveys in Crimea by KIIS showed a split opinion (41% yes to joining Russia in February 2014). After the success of the revolution in Kyiv, the ratio of those who wanted to secede and join Russia undoubtedly jumped due to television-fed perceptions that ethnic Russians would become second-class citizens in Ukraine. Russians in Crimea have a very negative opinion of the EuroMaidan movement, with only 2.5% of our sample, thinking it improved conditions in Ukraine, and over 90% believing it made things worse. This ratio is not very different in the six regions in southeast Ukraine that we surveyed where only 10% believe that the EuroMaidan success improved conditions in the country). Judging that the rights of Russians in the country were under threat, a pessimistic mood reinforced by Russian television (which, our poll documents, is the main source of news, and is trusted by this majority population in Crimea), the ratios presented here reflect a profound sense of alienation from Kyiv and its pro-Western leadership, and a preference for Russia as a guarantor of ethnic Russians’ status, power and future. Third, we asked Crimeans to what extent they felt European. Unlike residents of western and central Ukraine who tend to readily self-identify in these terms, the strong majority (85%) of the population of Crimea do not perceive themselves as European. Respondents in the six regions in southeast Ukraine were evenly split on this question, with 45% identifying definitely or probably yes while 45% identified as definitely or probably no. Again, Tatars show some differences on this question from other Crimeans, though it is not as dramatic as others; less than half of this Muslim minority see themselves as European. Our survey and previous surveys show considerable divisions over a European, and especially a Euro-Atlantic, orientation in southeast Ukraine. This self-perception poses a challenge for the Poroshenko government as it seeks to build closer relations with the European Union, and aspires to join NATO. The strongest self-identification in Crimea was as Crimeans, then as Russian citizens, then as Soviets (47%). Identification as European is, of course, strongly contextual and fluid: some Russians readily embracing this identity while some British, for example, actively reject it. The extent to which it has become a marker of a ‘civilisational divide’ in Ukraine, in opposition to a notion like the ‘Russkiy Mir’ (Russian world), is an important question. Certainly, the Kremlin has invested strongly in this notion, and more recently in the concept of separate civilisations. In Crimea, at least, the evidence suggests this is working – 89% of respondents agreed that Crimea belonged to Russkiy Mir, the mirror opposite of European feeling. In southeast Ukraine, the equivalent figure underscores the divide, with 51% strongly or mostly agreeing that their region belongs to the Russkiy Mir. However, we should not automatically assume that this is necessarily a binary choice for all respondents (there are respondents who choose both). Furthermore, and most importantly, we should not assume that those holding that their region belongs to Russkiy Mir are supporters of Vladimir Putin. In the six southeastern regions we surveyed, only 2.8% of respondents said they definitely trust the Russian president. Finally, our survey shows that despite the enormous support for the annexation, and the high level of optimism for the future, only one-third of respondents in Crimea believe that the annexation has been problem-free in the nine months leading up to the interviews. Tatars overwhelmingly stress the problems brought about by the change of government, with only a derisory 2% agreeing that it has been problem-free. Recent journalistic accounts have indicated the significant annexation difficulties, including ready access to the peninsula, which is now blocked on the Ukrainian side. Moreover, the expected boon in Russian tourism has not materialised; partly due to the significant financial pressures that Russian holiday-goers now face due to declining incomes. Issues of pensions, infrastructural improvements, administrative transfers from Ukrainian to Russian authorities, and reorganisation of security agencies all compound the daily difficulties provoked by the annexation. Future polling will reveal whether current frustrations wane, and whether the high support and expectations associated with annexation will remain, as recession bites within Russia. Recent journalistic accounts have indicated the significant annexation difficulties. Is the Crimean conundrum another case of an act that is ‘illegal but legitimate’? Are we dealing with another example of an act that is ‘illegal but legitimate’ in Crimea? Understandably painful as it is for Ukraine, the question warrants debate. The Kosovo case has important lessons for the international community about the importance of ‘remedial secession’ in cases of active physical oppression of a minority population. Kosovo is also held to have ‘earned sovereignty’ through accepting a period of international administration. By these criteria, the Kosovo case is clearly different from the Crimean case. Furthermore, Kosovo became an independent state whereas Crimea aspired to join another. Yet, at the same time, we need to recognise that while the circumstances under which Crimea became a self-determinating region, and by which its inhabitants expressed its opinion, were manifestly illegal, the majority of the current population in Crimea appears to approve of its unification with Russia. Across the former Soviet Union, a series of regions have long held unresolved legal status: Abkhazia, South Ossetia, Nagorno-Karabakh, Transnistria. Now they are joined by Crimea and Donbas. The circumstances of each are distinct but they do share familial origins and resemblance. Today, debate about these regions is in danger of being overwhelmed by homogenising legalism and geopolitical polemic. Is the ‘territorial integrity’ of the state the highest moral value irrespective of the circumstances? Are we to describe regions as ‘under Russian occupation’ when the majority of the population in these areas actively welcomes and supports the stationing of Russian troops there? We need a geopolitics that is about more than just ‘Putin and the West’, one that acknowledges past histories of sponsored settlement, forced displacement, war crimes, inept state building, and economic marginalisation in these contested spaces. We need, in short, to respect the complexity of places and the local voices of those – in situ and displaced – caught up in struggles over them. 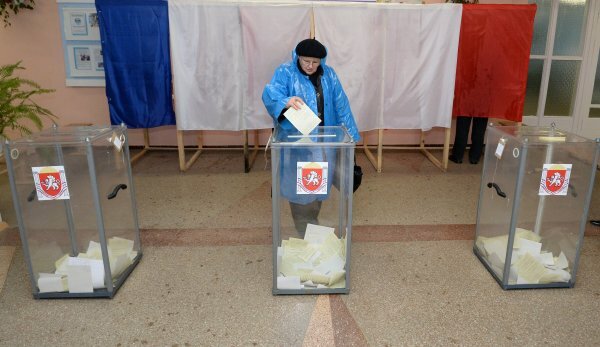 Standfirst image: A Crimean woman casting her vote in the referendum. Image by Mikhail Voskresenskiy via Rianovosti.